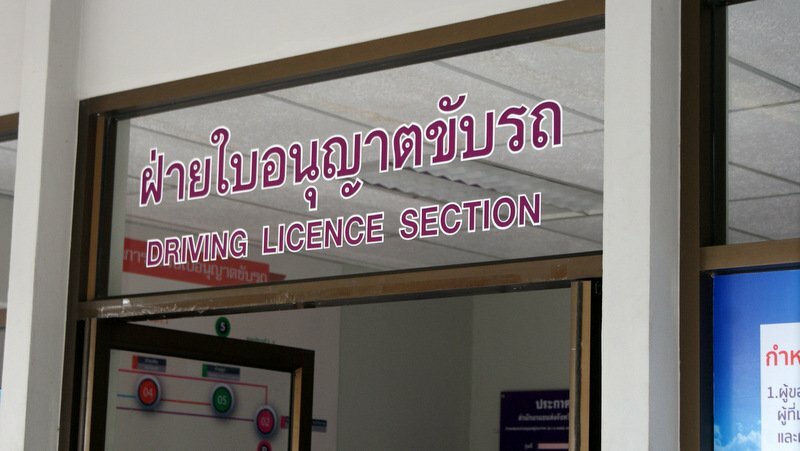 PHUKET: Tourists wanting to get a “temporary” Thai driver’s license – as advocated by a Phuket Vice Governor to an ambassador earlier this month – will have to join the queue along with everyone else applying for a new Thai driver’s license, The Phuket News has confirmed. The re-confirmation follows Dutch Ambassador to Thailand Kees Pieter Rade visiting Phuket on June 9 to ask officials here about what steps were being taken to improve the safety of tourists on the roads while they are on holiday in Phuket. However, the Chief of the Driving Licence Department at the PLTO, Kanda Santipattranont, has told The Phuket News that no such special “temporary licence” for tourists exists. “The only temporary driver’s licence we issue is the standard ‘Temporary 2 years’ driving licence that everyone gets when they first apply for their Thai diver’s licence,” she said. As such, any tourists wanting to obtain a Thai driver’s licence must book an appointment, for which the first available time may be weeks away, obtain a letter from their embassy or Phuket Immigration confirming their registered address, complete five hours of driver training provided by a recognised driving instructor or school, and pass the standard theory and practical tests. As for tourists proving their residential address in order to be issued driver’s license, Ms Kanda explained that as tourists are entered by hotels into the immigration database as staying at their hotel, tourists can just go and ask Phuket Immigration for a letter confirming where they are registered as staying. A staffer at Phuket Immigration confirmed this to The Phuket News, but noted that the letter is not an official form marked with a TM” number. Alternatively, to avoid being fined by every police officer who stops them while driving during their holiday in Phuket, tourists must obtain an International Driver’s Permit issued in their home country and present that along with their actual driver’s licence issued in their home country. DK, it still doesn't make your comment correct, lao khao dulls the mind, and the ability to think straight. R2,it would be better to read an article well before responding to comments! The misinformation  (you calling it a lie) was made by the vice governor  and not by the governor ! And as "You" mentioned "lao khao",did you know that excessive use of it leads to a blurring vision? ! "Maybe the ambassador should educate his fellow countrymen first not to drive " etc, why more swerv-ing, the Dutch official did not lie, the Pooket governor did, but seeing you "protect" all things Thai, I guess we know why you make such rediculous comments. Too much lao khao perhaps. So it's perfectly acceptable for locals to flout the law habitually resulting in utter carnage day in day out as it's "their country" with little or no punishment but ho hum if a foreigner drives without a helmet or licence, get real. Maybe the ambassador should educate his fellow countrymen first not to drive a bike if they never drove one before.Or  to use always a helmet,same as they have to do in their own country.And what is the problem to apply for an international drivers license in their home-country? No need  for the governor to go to Bangkok to apologize.The ambassador should apologize for his law breaking tourists. So, as we expected, knowing a bit better than a vice governor about driving licenses, the Vice governor was just bull …..g the Royal dutch Ambassador. Plain lying. That is something shocking. The Phuket Governor should go to Bangkok , to the dutch Embassy and apologize for his lying vice governor. How about introducing a proper public transport service (network of buses) so tourists don’t have to rent scooters? The taxi cartels still hold the island to ransom which is a disgrace.